Femme Fatale Records: Land of the Free, because of the Brave - Thank you Veterans, past and present! Land of the Free, because of the Brave - Thank you Veterans, past and present! Yes, if it was not for them, things would be a little different for us all..! 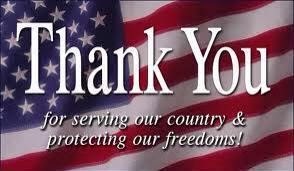 Definitely giving thanks to all the veterans past and present who give me the freedom to speak my mind of freedom! THANK YOU! Many thanks to all of America's veterans, from 1776 to today! We have veterans to thank for many things, both large and small, in this great country. If it wasn't for those willing to serve and sacrifice, we wouldn't be here to enjoy the One Eyed Cats music - that may sound like a simple thing, but if veterans made it possible for us to be here to enjoy the Cats, just think how many other larger and more precious things we have to be thankful to veterans for :) Thank you!